Succulent, sweet and golden apricots flambed in a little port and garnished with berries and nuts. This creation makes me think of this delightfully sweet dessert which goes equally well with dollops of old fashioned vanilla ice cream. 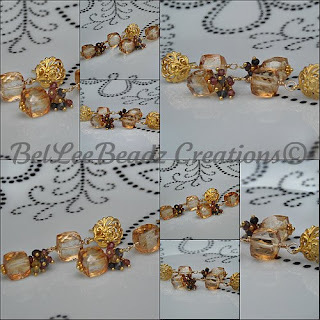 Mystic apricot quartz squares and a generous topping of petite multi colored sapphire faceted rondells. Gold filled wirework and 24k gold vermeil earposts. Drop of 4.5 cm. Perfect for the upcoming Yuletide festivities.